Living history farms and museums are a fun way to introduce kids and adults to traditional ways of life, but they are also an excellent resource for learning traditional skills. Many living history farms and museums offer classes to the public. Woodstove cooking, cheese making, blacksmithing, hearth cooking, broom making, baking, are just some of the classes you can find at some of these living history sites. 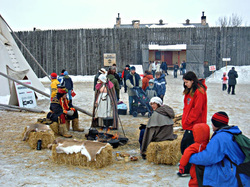 Look for living history farms and museums in your area and see what they offer. You might even want to volunteer to help pass these traditions on to the next generation.